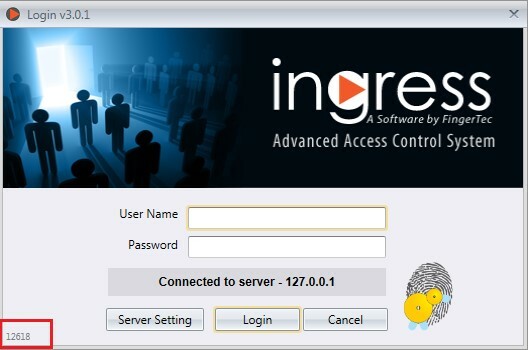 In an event where you have forgotten your administrator password to login into your Ingress software you need to contact our support team at support@fingertec.com. We can help you generate a temporary password to login to your software. However this feature is only available after you upgrade your Ingress version to Ingress v3.0.1 and above. Locate the 5-digit code display at the left lower corner of your login screen in Ingress. This is a very important number, which you need to email to us to request for the new password. Once you have sent the number to us, do not enter any password or turn off this screen because this random code changes every time you restart the software or fill in the wrong one. We will provide you with a one-time-use password that is valid for only one login session to Ingress. Insert “admin” into the User Name column and the provided password into the Password field and click Login. The system will automatically request a password change after the login. Create and confirm your new password here. Note: This password retrieval option will only work with the System administrator password but not for the Ingress client login password. In case your staff has forgotten their Ingress client login password, the administrator will need to generate a new password on their behalf under System Settings > User Role. how I can get the password or reset it ? For your kind information, we only can help you to reset the Ingress password, and not the DB installer. This is because DB installer password is the password that you set from MySQL, and if you forgot it. You need to do the complete installation by removing all the Ingress and MySQL folder from your PC, and after that start with fresh installation. That's why we recommend you to use the username and password as root and root so that it will make all the user easy to remember it. in this case we will lose all data, am I right ? Yes sir, if you do this steps, you will lose all of your data. But if you have a copy of files from your backup files, you can restore it back. That's why you need to backup your data at least once in a month so that if anything happen, you still have backup from your database. Do you have set for door access level? If Yes, please change the access level into "Full Access", then synchronize the setting to the devices. Hi, resetting of forgotten password is free? In regards to your inquiry, yes it is free and may I know which software that you're using either Ingress or TCSMv3? Please provide us the 5 digit number on the login box so that we can provide the temporary password.